Brand Building is the process of ensuring that people are familiar, aware and recognise your business. Brand building can be strengthened by identifiable logos, brand colours, brand story and consistent marketing and advertising messages. Short-Term marketing activities are favoured by many businesses as they provide the opportunity to promote offers, competitions and additional benefits to help increase sales and revenue. The rise in the popularity of video and content offers an instant route to market, and provides an engaging way for viewers to process information. 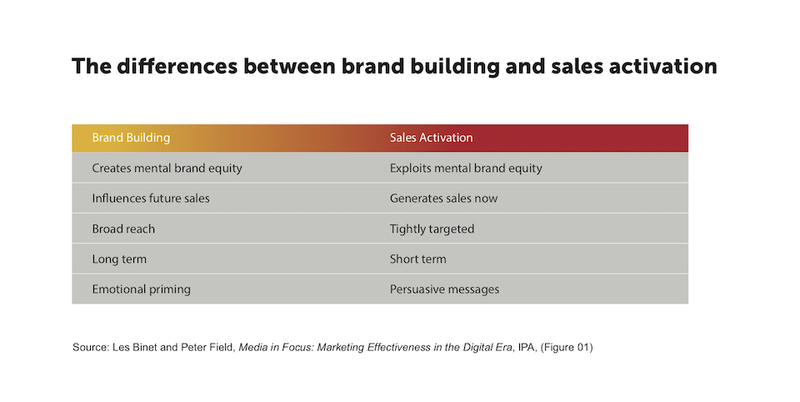 Although short-term activation can lead to a ROI (return on investment) and contribute towards short term gains, used in isolation, this style of marketing demands constant energy, attention and monitoring. Advertising campaigns offer the perfect opportunity to promote brands. Brand campaigns are usually identifiable as they often focus on creating a concept that is visually appealing, emotional, comedic or informative; all styles that promote recognition and easy recall. The DRTV Message – will promote the product and service offering along with the short-term promotions. Omni-channel furniture retailer ‘Oak Furniture Land’ found the perfect advertising combination with their use of Brand and DRTV activities. Oak Furniture also enhanced their advertising effectiveness by basing a number of their creative concepts within their stores, this resulted in their audience becoming familiar with their physical bricks and mortar identity. Launching their new brand concept during the ad-break for the X-Factor in 2017, Victoriaplum.com used the results of their in-depth market research to create an emotive advertising campaign that would resonate with their target audience. This 60-second Brand campaign was complimented by a DRTV campaign that concentrated on the products. Brand building is fundamental in saturated markets. When investing in campaigns, brands must focus on providing a clear call to action and direction, failure to do so will result in their competitors reaping the rewards of advertising activities. For instance, following exposure to an advertising campaign, the viewer must be driven to perform a Google search for the brand, e.g “Victoriaplum.com, rather than a product or service e.g. “Buy New Bathroom”. Expanding their resource areas to cover topics and subjects that complement their offering. If you need some creative guidance on how to develop a perfect video content strategy that focuses on brand building, please contact us.